Robin Varnado (l.) and Yesenia Feliciano at the welcome desk of the teen health center. HUMBOLDT PARK — Being 16 and pregnant is much more real than any MTV reality show. When Yesenia Feliciano walked into the Erie Teen Center as a pregnant teenager, she was scared. Her mind was racing, wondering what the employees sitting behind the desk were thinking. "They don't know what I'm here for," she tried to convince herself. "Do they know? Do they?" Fourteen years later, Feliciano is on the other side of that desk where she is usually the first person to greet teens. The Erie Teen Center, which has been around since 1985 in various locations, moved into its new home at 2418 W. Division St. in November and plans to expand even more at that location this summer. "I have patients who have had similar situations to mine and I'm able to just talk to them," said Feliciano, 30. "I feel like I’ve empowered some girls." There are times teens — some pregnant, others seeking reproductive health services or testing — come in with parents, but often times they don't. Regardless of their reason, the goal of the health center is to make new patients as comfortable as possible. As the only freestanding teen-only center of its kind in the city, the center provides specialized services for teens and young adults, offering a confidential space where they don't have to worry about running into a neighbor or elder. In the state of Illinois patients 12 years and older, both males and females, can seek care on their own. The center offers free pregnancy and STI/HIV testing as well as reproductive services, counseling and behavioral and health counseling. Feliciano's experience is a big reason she came back to work at the Erie Center eight years ago, and why she plans to keep working there until she retires. "By the time I left, I felt better. Every time I came my confidence was building up," Feliciano said. "I was not ashamed anymore being 16 and pregnant. I knew because of my clinic and everyone there. They offered so much and they empowered me." The main message she took away was that "things happen, and you are going to be OK."
Feliciano said her grades went up, she graduated high school and now has a family. Her now 13-year-old son attends private school and is on the honor roll. The teen health center is still trying to get the word out about its new home, and its director anticipates about 2,000 individual patients this year will make between 8,000 and 10,000 visits. The move from Ravenswood to Humboldt Park brings the center closer to the heart of the city, to be more conveniently accessible to more patients. "Historically, data shows that when you look at the City of Chicago that teen pregnancy rates, STD rates, HIV rates are much greater here than in other parts of the city where we were previously located," said Robin Varnado, director of behavioral and adolescent health for Erie. The key is to keep things positive. "You have to be bubbly when you work here," Feliciano said. "Patients are nervous and you can tell, sometimes, when you have new patients." 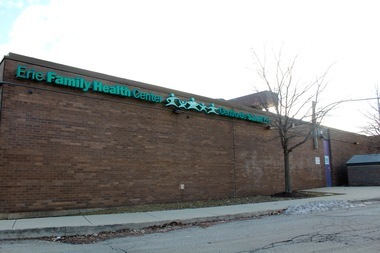 The Erie Teen Center, as part of its move to Humboldt Park, is celebrating later this month by hosting a benefit to raise awareness of the importance of confidential health services for teenagers. Many of the patients are faced with adversity, poverty and life challenges. "This is not just a clinic," Feliciano said. It's a family." The Love Not Lost benefit for the center will be held Feb. 20 at Morgan's on Fulton, 950 W. Fulton, and will partially benefit the Erie Teen Center. A $10 suggestion donation can be made at the door.